Purim and Hanukkah share a rabbinic origin, a festive character, and a generally informal nature. 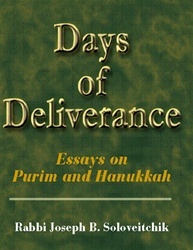 In the essays collected here, the eighth in the series MeOtzar HoRav: Selected Writings of Rabbi Joseph B. Soloveitchik, both holidays serve as subtext for Rabbi Soloveitchik’s classic search for religious meaning in a seemingly cold and arbitrary universe. For him, Purim and Hanukkah stand at the nexus of faith and history, of human effort and divine intervention, of solemnity and joyous celebration. In the Purim essays, the Rav offers not only commentary and textual interpretation, but, primarily, a rich blend of religious existentialism and Jewish historiosophy. He transforms the verses of Megillat Esther, and the Purim story as a whole, into a text about man in general and the Jew in particular. Employing classical midrash, historical analogy, a deep understanding of human nature, and a fine ear for textual nuance, he breathes vivid life into the characters and events of the Megillah, and demonstrates the story’s universal and contemporaneous messages. In the Hanukkah essays, too, the Rav draws universal lessons from the story of the Hasmonean rebellion and victory. 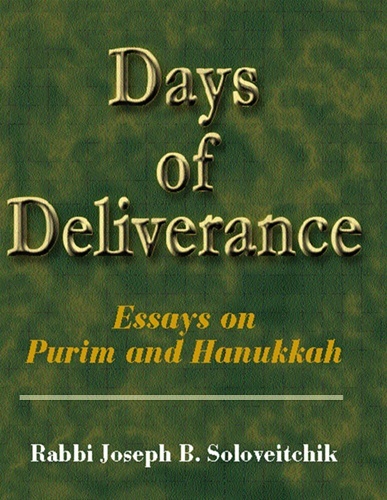 He applies his exegetic and homiletic skills to the account of Hanukkah in Maimonides’ Code and in liturgical texts, such as Al ha-nissim and Ha-nerot hallalu. For the Rav, the spiritual core of the Hanukkah story also provides the key to explaining distinctive halakhic features of the holiday. He views the spiritual struggle waged by Matityahu and his sons as symbolic of the battle for Jewish self-realization carried on by generations of Jews, from Jacob and Joseph in the Bible to our own day.